The 4040 by Eagleggo is a replacement humidifier solenoid valve manufactured for all humidifiers except residential models 110, 112, 330, 350, 360, 445, 800, and commercial models. The solenoid valve turns water on and off to your humidifier but does not regulate volume which is done by a different part called an orifice. Contains pre-installed strainer in the inlet side of the valve for capturing clogging elements in the water such as dirt and sand. Uses pre-existing compression fitting on the outlet side. Electrically operated and uses 24 volts and 2.3 watts. Manufacturer of this valve recommends that any wiring on your humidifier be completed by a professional contractor. -Both the inlet and outlet are threaded 7/16"-24 UNS for accepting a compression fitting for ¼" tubing. -Includes compression nut, washer and inline strainer. -The inlet includes the compression fitting & ferrule. -For the outlet, your existing compression fitting is reused. -NOTE: Manufacture recommends that any electrical work with your humidifier be completed by a professional contractor. Fits models 220, 224, 400, 400A, 400M, 440, 500, 500A, 500M, 550, 550A, 558, 560, 560A, 600, 600A, 600M, 700, 700A, 700M, 760 and 768. Does not work on models 330, 445, 110, 112, 350 and 360. 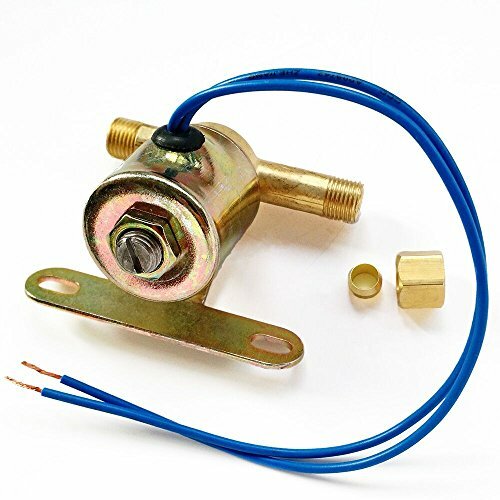 The 4040 by Eagleggo is a replacement humidifier solenoid valve. The humidifier valve includes compression nut, washer and inline strainer. This valve is comparable to Aprilair part # 4040 Fits models 220, 224, 400, 400A, 400M, 440, 500, 500A, 500M, 550, 550A, 558, 560, 560A, 600, 600A, 600M, 700, 700A, 700M, 760 and 768. If you have any questions about this product by Eagleggo, contact us by completing and submitting the form below. If you are looking for a specif part number, please include it with your message.